Mary Lamont Goes to China! MARY LAMONT GOES TO CHINA !!! 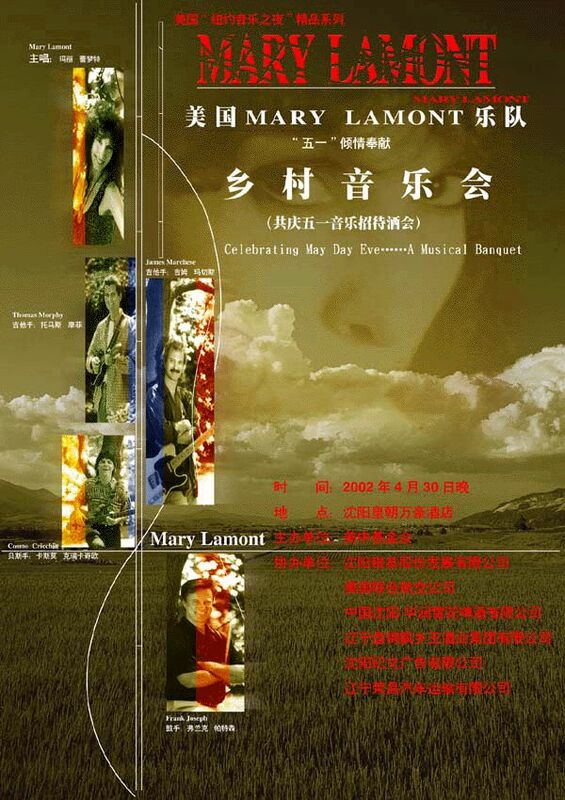 The Mary Lamont Band departed at the end of April 2002 for a 15-day, 6-city, 10-show tour of Mainland China. Mary and her band headlined in large venues with dates in Shenyang, Dalian, Guiyang, Beijing, Xiamen, and Nanjing. Touring with Mary were band members Jim Marchese (guitar  Mary's husband), Frank Patterson (drums), Cosmo LoCricchio (bass) and Tom Murphy (rhythm guitar and harmonica). The following is a review from China about the tour. On the vacation of the May Day in the beautiful spring, the famous American country music band Mary Lamont came to China to perform as visit artists for the Chinese audience. It was the first time for this band to set their feet on the land of China. The five members of Mary Lamont -- singer Mary Lamont, lead guitarist James Marchese, guitarist Thomas Murphy, drummer Frank Patterson and bassist Cosmo LoCricchio, have performed in New York for the Secretary of Liaoning Provincial Party Committee, Wen Shizhen and his entourage and received their unanimous high opinion. They had a group photo taken to mark the meaningful occasion. The band's musical tour covered six big cities of Shenyang, Dalian. Beijing, Xiamen, Guizhou and Nanjing. On the evening of April 30, a grand reception banquet was held in Marriotte Hotel. The banquet was hosted by Chief Announcer of Liaoning TV Station, Tiehui and Supervisor of the Art Exchange Department, Julia Zhu. During the banquet, Mary Lamont gave a very successful short show for the guests present. In addition, the talented teachers and students from the Shenyang Conservatory of Music performed together with the American artists. The honorable guests included Vice Governor of Liaoning Province, Zhao Xinliang, Chief of Liaoning Culture Department, Liu Xiaoyan, Deputy Secretary of Shenhe District, Chief of Shenyang Foreign Affairs Office, Duan Fujun, Representatives of American Consul, Russian Consul and Japanese Consul, the well-known cross-talk artist, Wang Ping, representatives of Yinji Group, Xinmeng Group, Rongchang Group, Liaochuang and some other enterprises and friends from the medias. At 6:00 pm of May 1, Mary Lamont gave their first public concert of their China tour on the Shenyang Municipal Square. The performance was very successful. The Chinese folk song "Nan Ni Wan" sung by Mary Lamont in Chinese pushed the concert to the high tide and got the enthusiastic applause from the audience. The concert received close attention and earnest reports from Liaoning TV Station, Shenyang TV Station, Shenyang Daily and other medias. The chief leader of Shenyang Municipal Party Committee, Zhang Xingxiang had given his support and official permission to this performance in Shenyang and instructed the Shenyang Municipal Culture Bureau to operate it carefully. On May 3, Mary Lamont performed at Diecui mountain villa in picturesque Dalian. Located on the suburbs of Dalian, the mountain-surrounding Diecui villa was crowded by the enthusiastic audience. Before the performance, these music-loving citizens gathered at the square in the villa very early, waiting for the performance of the artists coming from the other side of the globe. Big red banners hung from the surrounding big buildings made the square a splendid outdoor stage. At 1:30 pm, the concert started with the saxophone music played by the young students of the famous saxophone master, Mr. Gu Zhaoming. Then the singer Mary Lamont, who looked very young and pretty with her beautiful long hair, appeared on the stage. All the audience were grasped by their enthusiastic and beautiful music. During their performance, young audience swayed their arms over their heads and sang following Mary's singing. After the concert, many people offered to take photos with these artists. A young musical fan even threw off his white T-shirt to ask their autographs and another fan gave his amulet to the guitarist to show his respect. Reluctant to leave the square, most of the audience stayed for a very long time, following them disappear with their eyes. At 9:00 pm of May 5, Guiyang. In the banquet hall of Star Garden, where the former Vice President of PRC, Rong Yiren had written words of commemoration, the artists sit together with the staff of Star Garden, singing and chatting in a light and cordial atmosphere. Out of the hall, the surroundings were like a beautiful landscape painting with the clear and blue Star Lake, flashing lights and fragrant flowers. The surroundings were beautiful and the singing was rather more beautiful. In the hall, Mary leaned lightly against her husband and the lead guitarist Jim, singing sentimental love songs that could make everybody shed tears. Then the native Dong girls performed fork songs for these American artists. Mingled together, their melodious songs rang in Star Garden, till midnight. On May 8, these American artists flew via Guagnzhou to Xiamen a very famous coastal city on the east south of China . At night, Mary Lamont made a brilliant performance in the local biggest Entertainment club Youfu Castle. Having seen the band's introduction, a lot of Chinese audience and even foreign musical fans came here out of admiration much earlier before the performance. The audience gave the enthusiastic applause as soon as they stepped into the castle. The performance was very exciting and either Chinese and English songs stroke a sympathetic chord in the hearts of the audience. When the performance was near the end, the performance came to its climax and the enthusiastic shouts "One more, one more" could be heard constantly. When the performance ended, the audience were still reluctant to leave. They presented flowers, asked for Mary's autographs and showed their sincere hope to see their performance again. At 7:30 pm of May 9, Mary Lamont gave their performance in the Beijing Forbidden City Concert Hall. As a very famous concert hall performing mainly serious music, the Forbidden City Concert Hall held the American Country Music concert for the first time in its performance history. In the performance, Mary sang a lot of songs well-known both in China and America and was followed by the enthusiastic audience. The atmosphere of the concert is exciting and successful. John Denver's song performed by the guitarist Tom Murphy pushed the concert to the cheerful high tide and got enthusiastic applause from the audience. When the performance finished, the audience still shouted ardently "one more, one more" and at last the whole concert hall ended in warm applause. On May 12, the American artists gave their last performance at the Art Center Grand Theatre in Nanjing City, a very famous ancient capital on the coast of Yangtze River. The performance is a part of Jinling Spring Musical Week in Nanjing and the audience were all looking forward to enjoying the performance. The performance was planned to be held in the evening, but the reporters of Jiangsu TV came to their Hotel in the early morning. The interview lasted more than one hour. In addition, the reporters also interviewed the Executive Director Larry Lee at the theatre in the evening. Mr. Lee introduced the original intention and significance of this activity and answered the questions about the style of the band and this musical tour in China. At 7: 15 pm, the performance started in the opening speech by the hostess, the Executive Supervisor of the Culture and Art Exchange Department, Julia Zhu. The whole performance was very exciting and successful. Especially when Mary walked down the stage, singing and shaking hands with the audience, the audience burst into the most enthusiastic applause and the performance came to its climax. At last the artists stepped down the stage after many encores. The activity made the common Chinese audience enjoy the original American country music and have a further understanding of the lives of the common Americans. The whole process increased the exchanges of American and Chinese cultures and enhanced the friendship between the two countries and the two people. The artists group told the audience and the reporters they would come back to China very often in the future.